I built this pre-amplifier using the THEL VX-D modules for line-level amplification. The enclosure is made of a 90 mm thick chunk of layered birch ply. The bottom and rear plates are aluminum plates that were cut and engraved using a CNC machine. 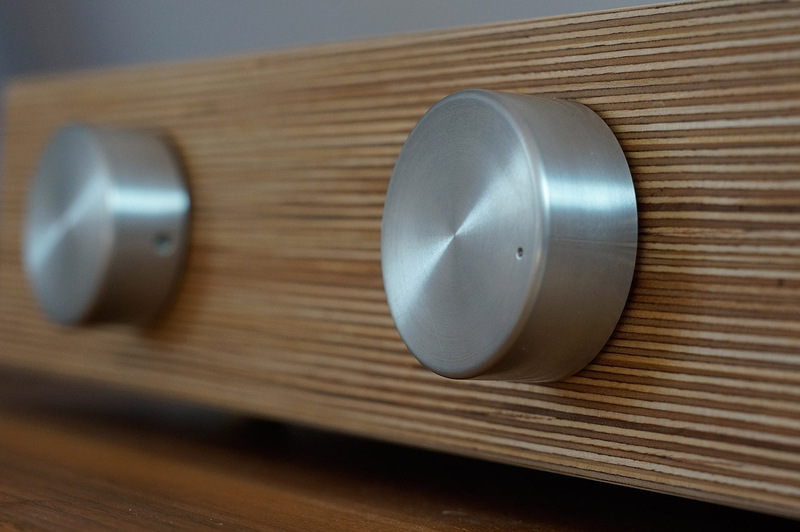 The custom-made source and volume control knobs were machined using a lathe. The THEL VX-D electronics use a discrete MosFET output stage with a very low output impedance. This prevents high-capacitance cables and low-impedance power-amp inputs from affecting the sound signals. The power supply uses rechargeable batteries instead of the conventional DC conversion from AC voltage derived from the wall outlet. This results in the cleanest possible DC voltage supply that is free of any hum or noise, which might affect the sound quality. The batteries are recharged automatically when the pre-amp is not in use to make sure the pre-amp is always ready to play. Update: now availble on HiFi-Bau Brennwald! 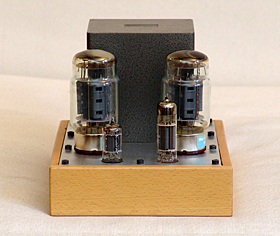 The 300B is an unusual single-ended tube amp with 300B power tubes. The amp uses two tubes in parallel, which makes it easy to produce 30 Watts of clean and wonderful single-ended 300B power! The input stage also relies on two paralleled triodes (ECC88), which drive the 300Bs through a step-up transformer. All this makes for a very simple and direct signal path with no capacitors. The 300B tubes can be replaced with stronger tubes, such as the 32B. 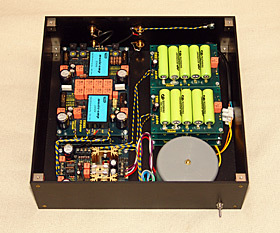 In this case, this single-ended amplifier can deliver more than 40 Watts! The aim in building this amplifier was to design a single-ended amplifier which has enough power to drive “normal” loudspeakers with sensitivities of 90 dB/W/m or less. I decided this design should work with down-to-earth voltages lower than 400 V and it should use easily available tubes. The concept of this amplifier is based on proven designs by Electra Print and Andrea Ciuffoli: The power stage uses two 300B tubes in parallel to produce enough power to drive “normal” speakers, while the venerable sonics and qualities of the 300B are retained. The input and driver stage (Based on a ECC88 / 6922 / 6DJ8 tube) is coupled to the power stage through a high-quality transformer. For simplicity and for best sondic results, no feedback loops exist in the amplifier. 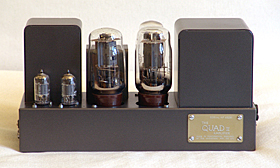 Only triode tubes are used throughout the entire amplifier. The power tubes are operated in fixed bias mode. Their operating point can therefore easiliy be adjusted to accomodate for non-matched tube pairs. This also allows the use of other power tubes, such as the AVVT 302B / 32B or the Emission Labs XLS tubes, which provide even more power than the standard 300B (e.g. more than 40 Watt with the 32B). This amp sounds very nice and clean. Yet, it has enough power to drive speakers like the ScanSpeakers without difficulties. 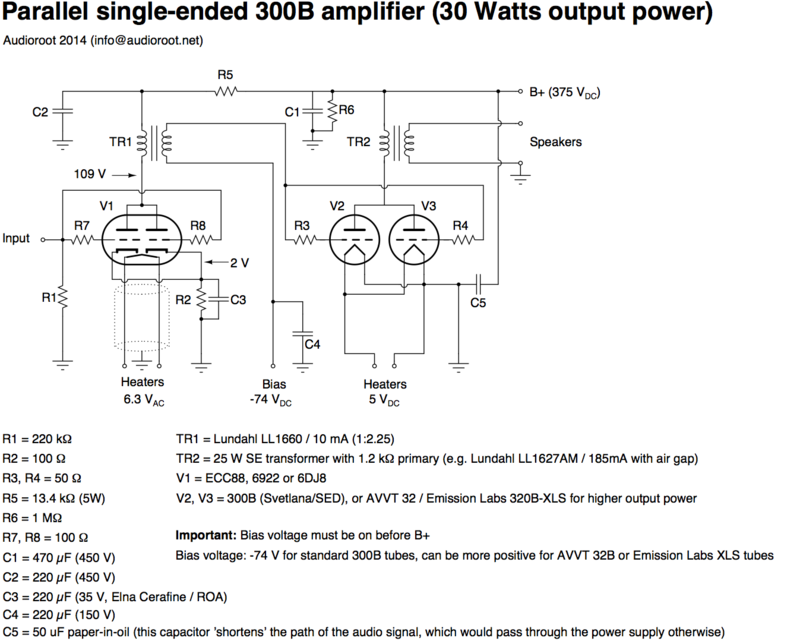 With standard 300B tubes, the output power is 30 W.
The B+ power supply design is, in principle, nothing fancy. In contrast to “traditional” designs, however, it uses two cascaded LC filters with massive inductors (L) and capacitors (C) to produce an extremely clean the B+ voltage. 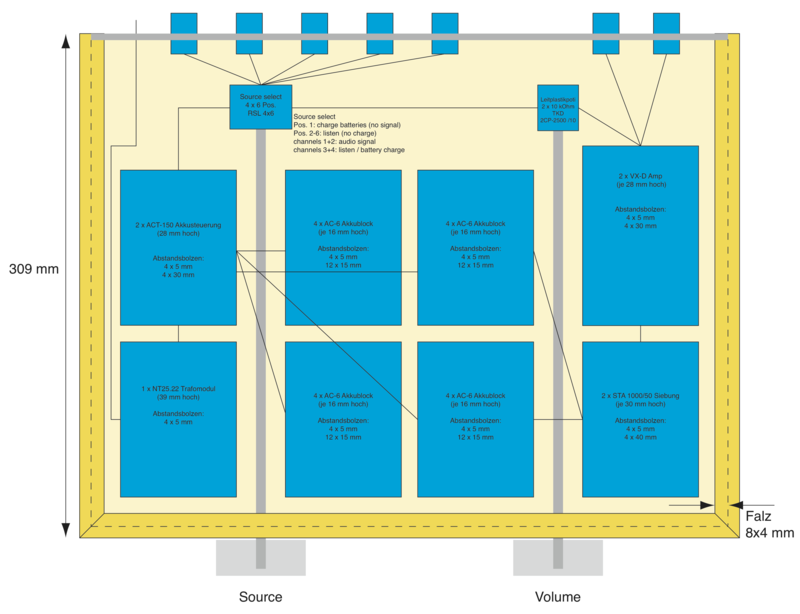 The energy stored in the last capacitor stage alone is enough to play music for almost half a minute without getting power from the mains (or to lift an average person by 1 metre into the air)! The rectifier is solid state (i.e. not a vacuum tube, which are not capable to deliver enough current for this amp). The rectifier consists of four high-speed and soft-switching diodes to avoid the negative sonic effects of “normal” solid-state rectifiers. For the filaments, regulated DC supplies are used. The DC voltage ramps up slowly after turning on the power switch. This increases tube life by avoiding excessive currents through the filaments when they are still cold. Electro Harmonix 300B gold (US$ 60 each): this tube shows standard 300B specs. The ‘gold’ version of the EHX 300B has a gold grid, which is supposed to improve the sound of the tube. As far as I understand, Electro Harmonix tubes are produced by the same people and machines as Sovtek tubes. As I’ve never seen a Sovtek tube working longer than a few minutes (!) before, I did not expect much of the EHX 300Bs. To my surprise, however, they survived several weeks, before they were replaced with Svetlanas (not because they were failed nor because they were bad in any way – but the Svetlanas just sound better). The EHX 300B are nicely built, with a beautiful white ceramic base. They have a powerful sound, but not as sweet, refined and detailed as the other 300B variants in this round (this is not necessarily bad, as, for instance, the Fullmusic 300Bs are way too sweet for my taste). Fullmusic / TJ 300B mesh plate (US$ 155 each): this tube shows standard 300B specs, but looks a bit differnt with its globe-shaped top. I like the looks, but others don’t. While it is not heavy or especially rugged, it is well built. There has been quite some buzz about the Fullmusic tubes, especially the mesh-plate version of the 300B. When I first listened to these tubes, I was blown away by the ease of how tiny little details in the sound were presented, while the sound stayed extremely sweet and some extra “quiteness” or “coolness” was added. After a while, however, I felt that these tubes lacked the punch to really enjoy the music (bass was deep, but lame) and that they made the music sound too sweet. Svetlana / SED 300B (€ 119 each): a tube with standard 300B specs and no fancy gimmicks (a rare thing these days!). Build quality is ok, although, unlike the other tubes in this list, their sockets are not made of ceramics. The folks at Svetlana don’t waste their money in the advertisement business (I’m sure they could have come up with something that sounds as fancy as extra large electrodes, gold grids, or mesh plates). Similarly to previous experience with Svetlanas KT88, their 300B convinced me with great sound: neutral, detailed, and dynamic. The sound has the same strength and “punch” as the AVVT32B, but is more refined and soundstage imaging is slightly better. Also, unlike the Fullmusic, the Svetlana sounds very neutral. So, who’s the winner? It depends. The AVVT / Emission Labs tube is expensive, but it’s construction can compete with a bottle of beer, sounds great and has enough power for a trance party. The Electro Harmnoix is the least expensive and sound ok. The Fullmusic is for those who crave for (overly) sweet sound. The Svetlana (my personal favourite) isn’t cheap but in the 300B PSE amp it sounds really good. This “passive” pre-amplifier is nothing more than an input-selector switch and a transformer attenuator to adjust the signal volume. In comparison to using a potentiometer (or a switchable array of discrete resistors), which attenuates the signal voltage by dissipating some (or most) of the signal power, a transformer attenuator has the advantage of passing the full power to the amplifier. With the transformer attenuator, the source can therefore drive the line stage and the power amplifier much better. This phono stage is based on the phono modules by THEL. The discrete phono stage is powered from batteries, which are recharged using the built-in charger. Due to a clever combination with the Teres, the phono stage is automatically disconnected from the mains supply during music playback, whereas the batteries are recharged while there’s no record spinning. During music playback, the phono stage is therefore completely isolated from the mains AC and its noise. This separation allows the cleanest possilbe amplification of the very low signals produced by the phono cartridge.This phono stage is based on the phono modules by THEL. The discrete phono stage is powered from batteries, which are recharged using the built-in charger. Due to a clever combination with the Teres, the phono stage is automatically disconnected from the mains supply during music playback, whereas the batteries are recharged while there’s no record spinning. During music playback, the phono stage is therefore completely isolated from the mains AC and its noise. This separation allows the cleanest possilbe amplification of the very low signals produced by the phono cartridge. I replaced the tube-rectifier (5U4) with a solid-state one. A solid-state rectifier can deliver more power and is more rugged than a tube-rectifier. I still use the choke to filter hash and noise, but I added more capacitance to the power-supply. This results in better filtering and better peak current handling. 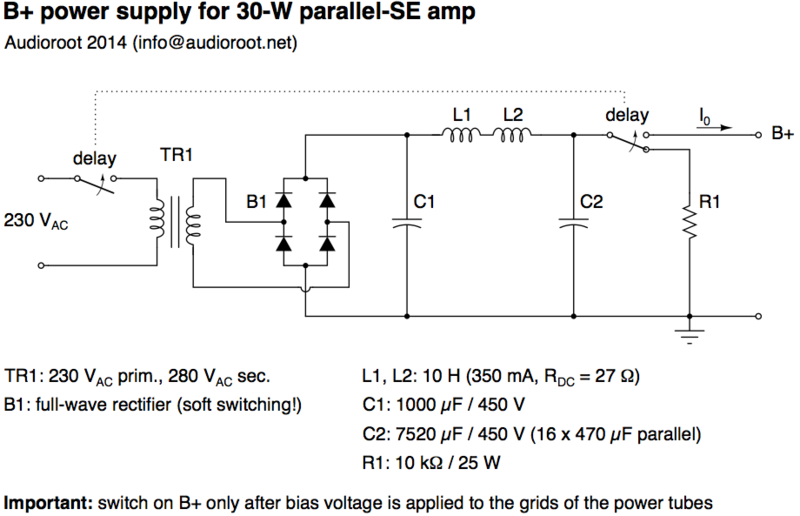 Low impedance at high frequencies means that the power supply does not distort short transients. 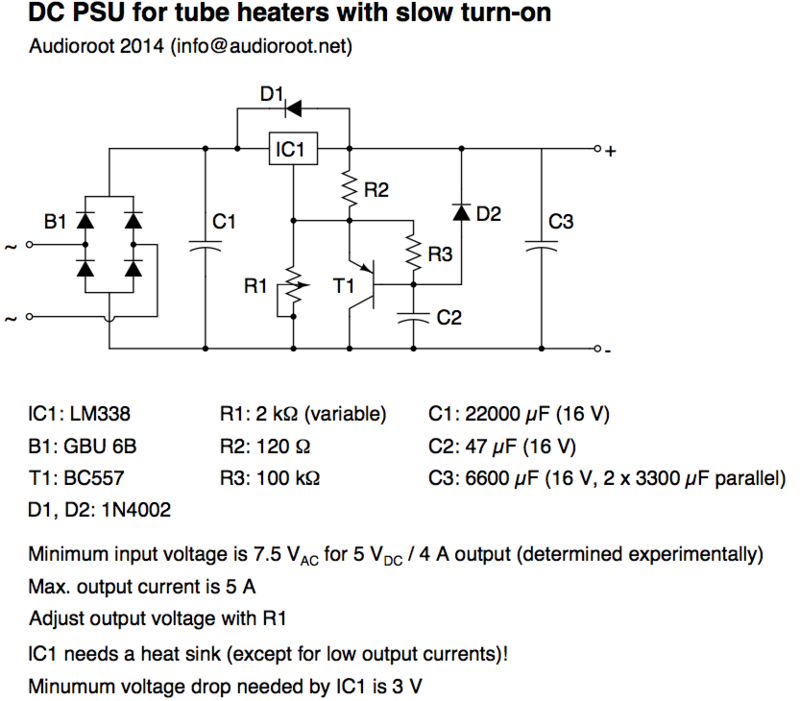 I use DC-voltage for the heaters on all tubes (including the KT88!) with a slow turn-on supply to prolong the tubes’ lives. I built the amp and the power-supply in two different blocks. This allows tweaking the power supply without taking the amp (and vice versa). An additional advantage is that the transformer’s magnetic stray field is far away from the amp, which reduces hum. The amps are smaller and nicer, too. 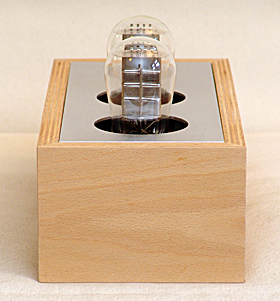 The case of the amp is a wooden frame with aluminium plates at the top and bottom. This is relatively easy to build but I still looks good. I used copper foil inside the case to shield the amp at the wooden parts. The good old Quad II from 1953! If there is something like a tube-amp legend, this is it! I refurbished these Quads to make them look and sound as new. I stayed as close to the original as possible, using original GEC KT66, GZ32, and EF86 tubes. 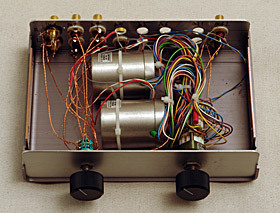 A 30-W tube amp using two 807 power tubes in push-pull arrangement. Schematic from David Sarser & Melvin C. Sprinkle (November 1949).